This is post 5 of 5 in the series Anthology of American Folk Music. Singer/songwriter Elvis Costello noted, “First hearing the Harry Smith Anthology of American Folk Music is like discovering the secret script of so many familiar musical dramas. Many of these actually turn out to be cousins two or three times removed, some of whom were probably created in ignorance of these original riches.” Folkways Records released the Anthology on six long-playing records in 1952, and Smithsonian Folkways Recordings re-released it on compact disc in 1997. It consists of three volumes, each containing two discs: Ballads, Social Music, and Songs. 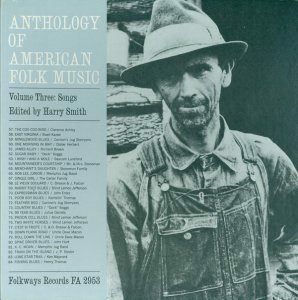 This post explores Anthology of American Folk Music Volume Three – Songs. All three volumes of the Anthology contain “songs” by most definitions of the word. Volume One – Ballads focuses on songs that can be more specifically identified as ballads because of their strong narrative line. Volume Two – Social Music is dedicated to songs that serve community gatherings of dance or worship. Volume Three features non-narrative folk songs, including blues, cowboy, jug band, and other forms that don’t quite fit within the parameters of the other two volumes. Many are of the type that Harry Smith, editor of the Anthology, categorizes as “folk-lyric.” These are songs made up of verbal fragments or floating verses that have been shared among multiple songs and don’t necessarily connect logically to each other within a song. Bascom Lamar Lunsford was a country lawyer and musician from Madison County in western North Carolina. Known as “The Minstrel of the Appalachians,” he traveled extensively through the mountains collecting folk songs. Lunsford recorded a few songs for the Brunswick record label in 1928, including “I Wish I Was a Mole in the Ground.” In later years, he recorded 350 songs for the Library of Congress. Listen to “I Wish I Was a Mole in the Ground” again and again. Learn to play the banjo and sing it yourself over and over again, study every printed version, give up your career and maybe your family, and you will not fathom it. This writer can attest to that statement, having engaged in most of the aforementioned activities. Lemon Henry “Blind Lemon” Jefferson was one of the first rural or country blues artists to achieve popular success with just guitar and voice. Born blind in Wortham, Texas, Jefferson earned money busking in the streets of Dallas. He also traveled extensively, sometimes in the company of singer/guitarists Josh White or Huddie “Lead Belly” Ledbetter. He made a series of successful recordings for Paramount Records between 1926 and his death in 1929. Jefferson recorded “See That My Grave is Kept Clean” in 1928 at his last recording session. He died a short time later in Chicago. The Memphis Jug Band, led by singer, songwriter, guitarist, and harmonica player Will Shade, recorded “K.C. Moan” in 1929. Jug bands flourished in the first decades of the 20th century, especially in cities along the Mississippi River. Their styles mixed jazz, blues, ragtime, and string band music. Jug bands played homemade instruments such as the jug, washtub bass, washboard, spoons, comb and tissue paper kazoo, in addition to manufactured instruments that might include guitar, banjo, harmonica, and mandolin. The following Spotify playlist is a close approximation of Anthology of American Folk Music Volume Three – Songs. The actual Anthology is not on Spotify. Most of the tracks on this playlist are the same recordings in the same order but from different sources. You should purchase the real deal on compact disc or record to get all the essays and annotations.